Martin Luther....translated the bible into the language of the people. AND he also translated worship into the language of the people. Liturgy (which means ‘work of the people’, but also refers to those wrote prayers, litanies, responses, music etc…) was changed so that the people could be included. No more secret prayers, no more facing away from the people, priests spoke in the language that most people understood, and worship was about participation and designed to be for the people. 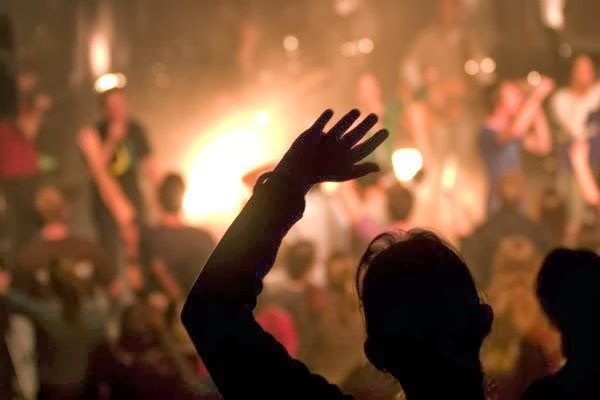 Worship was so that the people could hear the Gospel, instead of be bystanders to the hocus-pocus magic. The assembly, all the people gathered for worship, were now considered necessary. Now 500 years later, despite all lessons of the Reformation that Protestants - Mainliners and even Evangelicals – have been teaching, we are going back to non-participatory, secret language, performative worship. Just like priests who lead worship in a language that few spoke, Praise Bands are incompatible with a worship that is done by the community. Rock Bands are by design meant to overwhelm the audience with sound. They are a performative medium, not a participatory one. I don't know about you...but I often feel that way during much of what constitutes contemporary worship. It is hard for me to engage and sing because often it is difficult for me to even hear my own voice. I find myself watching and enjoy listening to the music, but I don't feel invited to participate.